The latest update to Twitter's Vine app arrived this week with new ways to share the six second video clips. Most importantly, the Vine update added the ability to embed Vine posts online directly within the iOS app or from the Vine website. The new Vine embeds can take two forms: a simple layout that only shows the clip, and a "postcard" version that includes your name and the post's date and description. 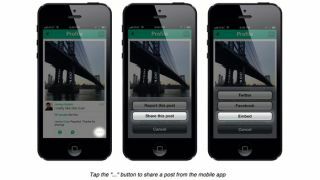 Vine posts can also be embedded in three sizes: 320px, 480px, and 600px. With the latest version of the Vine iOS app (sorry Android users, no Vine in sight for you still), users can embed Vine posts by tapping the ellipsis ("…") in the lower-right corner of a post. From there the video can be shared via an "embed" button that reveals the post's embed code, or added directly to Facebook or Twitter. This can be done on users' own posts or on the posts of others, provided those users have already shared their own posts outside of Vine. The embedded Vine posts that can be seen on Vine's blog, CBS, MLB, and USA Today look snappy and load quickly. They're certainly better than GIFs. Vine highlighted those websites specifically in its blog post announcing the embed update, indicating that support for the short-form video app goes beyond Hollywood (a clip from The Wolverine was published to Vine this week). "When we launched Vine, we described posts as 'little windows into the people, settings, ideas and objects that make up your life,'" Vine co-founder and general manager Dom Hofmann wrote in the blog post. "With today's update, you can display them almost anywhere."